Megamix is a mixture of organic acids used to protect the health of the flock during wet weather or when the humidity rises above 65%. The increased acidity does not damage the bowel in any way, but does prevent the acid fearing germs, notably Ecoli and thrush from multiplying. It is used in aviaries when a humidity problem turns the healthy nugget droppings to mush. The principal function of Megamix is to protect the healthy flock from the damaging effects of high aviary humidity, but it must be used at the first signs of a dropping change. When used at the very first signs of the dropping consistency Megamix gives immediate results, returning the droppings to the small, nuggets that signify good health within 8 hours. It is used for one day or can be given continuously during wet spells to protect the health of both adult and young birds, eliminating the need for stronger medicines. To the uninitiated it always seems strange that high humidity (i.e. moisture content of above 65% in the air) causes illness in birds, but it is an undisputed fact that most of our caged birds do not enjoy a high humidity. It is obvious to all fanciers that their flock looks duller on rainy days than when the sun is out and that the droppings "go off" when it rains and tighten up when it is dry. This occurs because high moisture in the air is accompanied by an increased bowel germ count (Ecoli and thrush) which causes "gut ache" loose droppings. The "upset" bowel will take the birds off form and when the wet spell continues for more than a day their health is endangered. 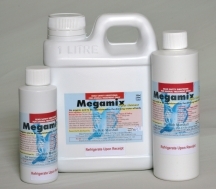 The Megamix lowers the germ count and immediately protects the fitness and health of the birds. The best results come when you use Megamix at the very first signs of change in the dropping. The dose of Megamix varies from aviary to aviary depending upon the humidity in the local area and the hardness of the local water. Some use it at 2mls per litre of drinking water to good effect, whereas another aviary may require 5mls. Some humidity susceptible aviaries need very high doses of up to 10mls per litre. You must calculate your own dose by noting the response of the droppings to the Megamix. Start at 2ml per litre and work your way upwards until you get the desired effect and then stick with that dose. Not only do the droppings return to normal by the afternoon, but also the overall appearance of the flock improves. Look for the return of the glass eye, the bloom on the flights, and a return to the silky feather of the bird in top form. 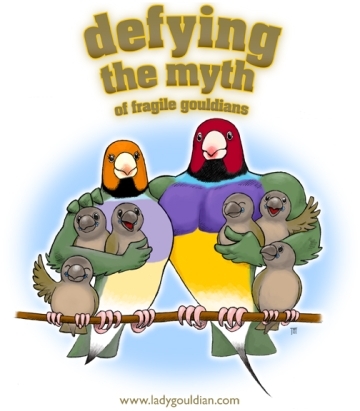 During wet weather the young birds are highly susceptible to health problems. Megamix given at a dose of 10mls per litre controls most young bird health problems without affecting their developing natural resistance. Megamix is completely safe to give during the molt. Megamix can be added to hand-feeding formula to help prevent yeast infections in baby birds. Using Megamix rather than Nystatin (anti-fungal medication) you will help the chicks to develop a stronger immune system. City Tap Water The amount of Megamix used will vary from aviary to aviary based upon the alkalinity of the local water. Normal city tap water has a pH of about 7.5 when it is full of chloramines. The pH will rise with the addition of more chloramines. Therefore city tap water predisposes a bird to bacterial, mold and Thrush growth on food and water ingested into the crop. With the addition of a water softener, the problem can be exaggerated even more. Normal Bird Crop Has a pH of 4; the proventriculus about 2; intestines around 6.5-7 and the cloacae a pH of 6.5-7. Megamix in normal tap water lowers the pH to 5.3 to 5.4. 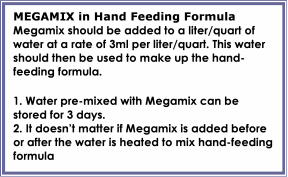 Therefore if the normal drinking water has an even higher pH than 7.5, the addition of more Megamix will be necessary to bring the pH into the 5.3 to 5.4 range. The amount of Megamix needed can be determined by observation of the droppings which should be tight and well formed with just a small amount of water. Megamix is used as the first choice acid cleanser for the healthy aviary. It is used for Ecoli and Thrush problems in aviaries with a humidity problem. It can be used for one day or continuously during wet spells for resting, molting, breeding or young birds. Megamix never depresses the form of a healthy flock and is safe to give to birds feeding young babies. KD is a stronger medicine which is used in aviaries, where Ecoli and Thrush is associated with other underlying health problems (fungus, toxins, worms ,"respiratory" diseases etc.). It kills Ecoli, thrush, fungus, viruses and respiratory illnesses without affecting the immune system, whereas Megamix protects the healthy aviary from Ecoli and thrush alone. KD will depress the form of the flock when it is healthy, but lift their spirits when it has an underlying health problem including Ecoli, Thrush.